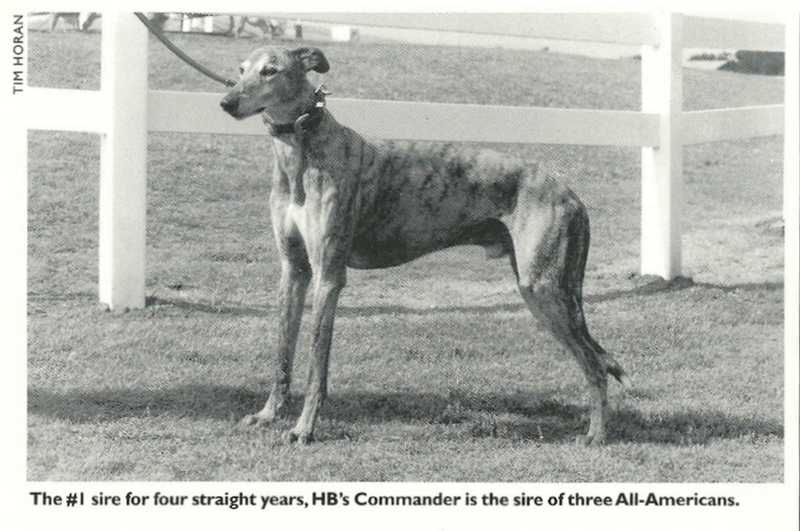 Mostly everyone who owns a racing greyhound, either as a racing professional, or as a pet owner, has heard the story of the legendary HBs Commander. He was sired by a greyhound that few people were aware of, out of a less-than-fashionable branch of an old and classic American-based female family. While he was an extremely precocious racer, and though he eventually was stopped by injuries and surgery, he was to prove to be an absolutely revolutionary sire. He led the US sire standings from 1994-1997 inclusive, and was elected to the Greyhound Hall Of Fame in 1999, in a large measure because of his prepotency as a modern cornerstone of the breed. He passed away unexpectedly due to an aneurism, at the relatively early age of 8. His son, Molotov, who led the sire standings for 5 years, and another son, Oswald Cobblepot, a highly influential contemporary of Molotov, distinguish HBs Commander as not only a sire of fine dams – like Oneco Malee, the dam of the mercurial Talentedmrripley – but as a sire of sires, an almost certain guarantee that HBs Commander’s influence upon the breed will be indelible. To say that HBs Commander’s phenomenal success was unexpected at the beginning, would not be an understatement. But succeed he did, in spite of the fact that he was not exactly lionized by breeders at the outset of his career as a sire. That would come later, after it was apparent that he was throwing quite a bit of himself into many of his offspring. And despite the protestations of his detractors, there was little doubt that HBs Commander seemed prepotent toward imparting a high degree of pace and power aptitudes, as well as his own rough hewn and burly – some would say unrefined and coarse – conformational attributes, to a great many of his progeny. Why this particular greyhound, among all his peers, and in the broader historical context of the breed, should become a sire of profound influence, is a matter for some inquiry, and might never truly be ascertained, from a standpoint of hard science. Yet, if we do a bit of research into his pedigree – which at first glance, seems not particularly extraordinary – we begin to understand the importance of racing, and why racing competition is so essential to the Racing Greyhound as a unique breed. Racing is what allows the breeder to place a relative value upon the quality of the stock he is producing, and the bloodlines from which he produces his stock. Racing, at it’s highest competitive levels, illuminates for the breeder, which individuals, and the families they are from, have achieved the highest levels of adaptation in response to the function of competitive racing, for the purpose of competitive racing. It allows for the most accurate and “correct” selectivity from among the racing population, as to which greyhounds, and which families of them, are best adapted and likely the most capable of carrying on with the breed, and of having input to the gene pool of the Racing Greyhound. Real Huntsman’s legendary career, and his 2 victories in the greatest and most prestigious open stakes race in the history of the Sport Of Queens in the US – the legendary American Greyhound Derby (first run at Taunton, MA, in 1949) – remain virtually unparalleled in the history of racing. Another branch of the Miss Judy female family was to produce the foundation dam of the Beckner family breeding dynasty, Mary Moore, who is the direct female ancestor to Buzz Off, a Hall Of Fame brood matron. The branch of the Miss Judy family from which HBs Commander descends, is divergent from both of these. It’s most profound previous expression had been the 2 time All American, Rock A Dee, by Go Rockie ( a son of 1956 American Derby winner Go Rock) x Dixie Day, a brood standings leader in her time. Interestingly enough, HBs Commander’s sire, the unheralded and sparingly bred Akbar, traces his direct female ancestry to Je Nays Empress – who is a direct female descendent of Medora – the aforementioned dam of the aforementioned 1950-1951 American Derby winner, Hall of Fame inductee, Real Huntsman. Akbar’s paternal grandsire, Tara Bounder, also carries Je Nays Empress as his 2nd dam. Je Nays Empress (Ample Time x Je Nay) carries the first American Derby winner, Oklahoman, as her damsire. She is the dam of 1967 American Derby winner Xandra, by Julius Caesar. Julius Caesar is the 2nd damsire to Kelton, who is the sire of Akbar – and Julius Caesar is the damsire to Big Whizzer, the sire of Downing…..who is the damsire to HBs Commander. Downing is thought by many to have been the most precocious and perhaps even the fastest greyhound ever to set foot upon a racetrack in the US. In addition to his startling and legendary victories in the prestigious Hollywood World Classic, and the Biscayne Irish American – Downing bronzed his immortality as a racer, by winning the most coveted trophy of all, with his hard fought victory in the 1977 American Derby. So, while we may debate the state of the sport of greyhound racing today, and its place in the modern day scheme of things, there can be no debate whatsoever as to the critical importance of one single race – The American Greyhound Derby, in the pedigree and to the immediate ancestors of HBs Commander. He is steeped in the blood of American Derby winners and their families. This single race appears to have been a highly predictable indicator of the bloodlines which were paramount in their era, and among the most worthy of perpetuation, as we can see, as an indicator of the most highly adapted and prepotent individuals who would carry them forward into this modern era. They would one day again find ample and at times, exquisite expression throughout the racing greyhound breed, through a greyhound who at first glance might seem to have been from the “wrong side” of the breeding tracks. When in actuality, he was quite adequately predisposed, by virtue of his ancestral relationships to success in the American Derby, to be both a racing and breeding “locomotive”…..HBs Commander. Dennis McKeon is a former greyhound trainer, a geneology buff, a founder of RaceForAdoption, a foundation that encourages dog owners to contribute earnings money – $150,000 plus to date – to help greyhounds on their way to adoptive homes, and is a fine writer as well.